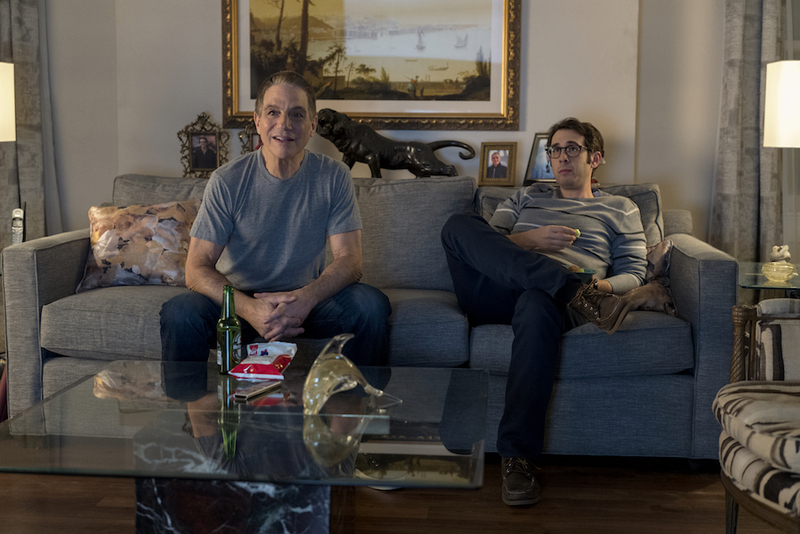 Tony Danza reminds us of the good ol' days while Josh Groban represents what's wrong with the future — or at least Netflix's algorithm. Tony Danza and Josh Groban’s good cop/bad cop routine is busted, but not for the reasons you might think. For one, Danza is great as the corrupt detective kicked off the force in very public fashion. His Tony Sr. is a joke-teller, barroom crooner, and all-around man of the people; the kind of lovable wiseguy you would immediately forgive for any well-intentioned indiscretions… unless, that is, he’s your father. Tony Jr., or TJ (Groban), is the exact opposite of his dear ol’ dad — not that he’s unlovable; he just follows every rule, from specific points within the police code (he often cites others for “infractions”) to the implied but oft-violated social agreements like refusing to pick up an unclaimed quarter. One guy is a beloved bad cop, the other is an ostracized good one. The odd couple setup is obvious, simple, and certainly solid enough to carry a crime-of-the-week procedural — or, since this is a Netflix original series where all the Season 1 episodes are released at once — a crime-of-the-every-44-minutes-or-so procedural. “The Good Cop” never aims to be anything more than an amiable distraction, the same as creator Andy Breckman’s last series, “Monk,” which starred another Tony and took home a bunch of trophies. Shaloub (in)famously won three Emmys in the show’s first four seasons, and Danza may find his way to the Golden Globes if viewers spark to Breckman’s new series. But Groban will not, nor should he really be “The Good Cop’s” namesake. The singer-turned-actor, who’s popped up in everything from “Crazy Stupid Love” to “It’s Always Sunny in Philadelphia,” isn’t a bad actor. He’s serviceable, relatable, and arguably a purposefully insipid foil for Danza’s exuberant energy. But he doesn’t add anything to a character who’s conceived to be a blank slate, and “The Good Cop” doesn’t help him out in the slightest. It’s the TV equivalent of a white canvas where only the actors get to paint, and Groban doesn’t even get a brush. Take, for instance, Episode 6, “Did the TV Star Do It?” In the opening scene (as happens in almost every opening scene), a dead body is discovered. This time, an environmentalist group cleaning up the riverside finds a woman’s body in a garbage bag. Though that may sound unsettling or even tawdry, don’t worry: “The Good Cop” starts mocking the head activist soon after, a ponytailed man whose crusade to save our planet is obviously a worthy target for belittlement. He proposes an incomprehensible recycling program where different items are tossed in hundreds of color-coded canisters, pitches the idea of using biodegradable paper trash bags that can’t actually hold trash (“There may be some seepage!”), and then hands the officers a business card made out of tissue paper that can’t be kept anywhere without blowing away or being crumpled. This, of course, is annoying, but it’s not really what’s wrong with “The Good Cop.” Sure, the series’ comedic intentions are uncaring and all over the map, but once Groban starts going over the case file, that’s where things hit a skid. As TJ tries to pin the crime on his prime suspect, a late-night TV host played by guest star Bob Saget, Groban has nothing to do. While Tony Danza sings so well he books a spot as Saget’s sidekick, Groban is obediently following up on leads, hunches, and witness statements. He’s basically doing paperwork while his co-star is literally tap-dancing. Why “The Good Cop” would abstain from putting an award-winning classical musician behind a microphone is baffling, and it goes to show what little else Groban can do when he’s denied showcasing his most prodigious talents. His character’s reactions are suitable, but rarely nuanced. His comedic timing is in the right zip code, but never waiting at the front door with flowers. His chemistry alongside TJ’s requisite partner/love interest is handed to him by his hard-working co-star, Monica Barbaro (who’s, all in all, quite good). But TJ never stands out from the guidelines given to him right off the bat. He doesn’t melt your heart when his goody-two-shoes instincts prevent him from having a good time, nor does he feel like a real, live human being during downtime between cases. Part of that is on the scripts, which don’t provide much in the way of TJ’s backstory (because this is an episodic procedural meant to be as accessible as possible), but part of it is on casting. Shows like “The Good Cop” only work when the actors are bouncing off each other with excitement; when they build an addictive rapport; when they find ways to create charming quirks, characteristics, and personality within a character who’s intentionally only half-formed on the page. Groban isn’t experienced enough to do that. He hasn’t lived in a character long enough, and this is a lot to put on a performer who’s in his first series regular role. Of course, the counter-argument is that a veteran like Danza will pick up the slack. He does what he can, and he is a delight. All that time on multi-cam sitcoms like “Taxi” and “Who’s the Boss?” help Danza know how to make the most of his screen time. Tony walks around his big Brooklyn house with bright white boxer briefs and stretches out his tiny white t-shirts at the collar. He smiles six different ways and can well up with such intensity you’re right there with him when the tone shifts from comedy to drama. Danza is a big personality filling a character with a big personality. Groban is the opposite for both, and no matter how great Danza gets, the odd couple dynamic doesn’t work when one guy’s doing all the work. Casting a name over a great actor is nothing new in Hollywood, but there’s something extra wonky about this instance. Netflix isn’t just trying to make the best shows or even the best version of each show. 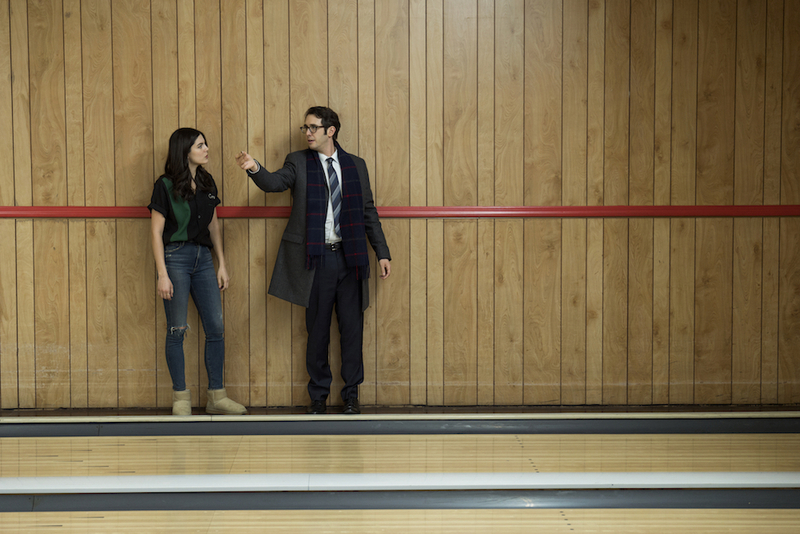 The streaming service wants to provide content for every demand, and somewhere out there, people wanted to see Josh Groban in a pleasant, simple, sporadically funny TV show. They may not have said it out loud, but the Netflix algorithm already knows people like “Monk,” people like the guy from “Who’s the Boss?”, and they like that nice singer who knows when his presence alone can create a funny moment. Too bad the algorithm doesn’t recognize an experienced actor’s presence — like, say, Josh Peck — is what makes the real difference. “The Good Cop” Season 1 is streaming now on Netflix.